Enjoyment triples with each bite of these rich, chocolatey cookies. PREHEAT oven to 350° F. Lightly grease baking sheets. 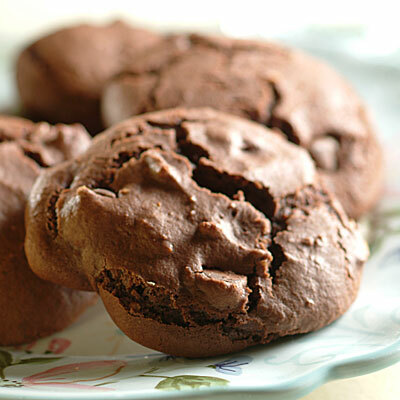 COMBINE flour, cocoa and baking soda in medium bowl. Melt 1 cup morsels and butter in large, heavy-duty saucepan over lowest possible heat, stirring until smooth. Remove from heat. Stir in sweetened condensed milk, egg and vanilla extract; mix well. Stir in flour mixture. Stir in nuts and remaining morsels (dough will be soft). Drop dough by rounded tablespoon onto lightly greased baking sheets. BAKE for 8 to 10 minutes or until edges are set but centers are still slightly soft. Cool on baking sheets for 2 minutes; remove to wire rack to cool completely.